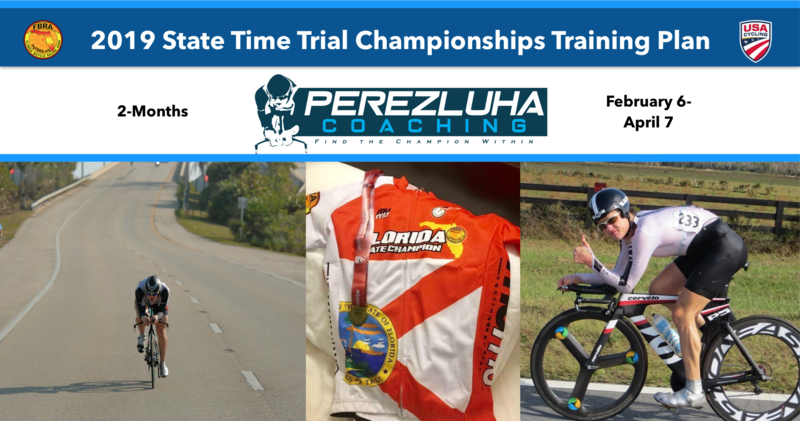 Get into the best time trial shape of your life and compete at your very best in the 2019 Florida State TT Championships on April 7, 2019. Develop better pacing and mental toughness to master the art of the time trial! Training Plan – You will receive a customized 2 months training plan starting February 6, 2019 and end April 7, 2019. This training plan is designed to maximize your time trial abilities and to learn valuable techniques specific for this event. Data Analysis – We will analyze together during our phone and video calls your power, heart rate, speed, and training data. Phone Calls – You will receive a weekly call. FaceTime Video Calls – You will receive 2 video calls. Advice for Day of Event – You will receive specific advice on what equipment, gearing and clothing to use specifically for this event. Perform your best at the Florida State Road Race. Develop better hill climbing ability and come into the state road race ready to win! Improve your FTP, hill climbing efficiency, all-around strength and ability, and learn the art of winning! Training Plan – You will receive a customized 3 months training plan starting July 18, 2019 and ending October 20, 2019. This training plan is designed to maximize your road racing abilities and to learn valuable techniques specific for this event. 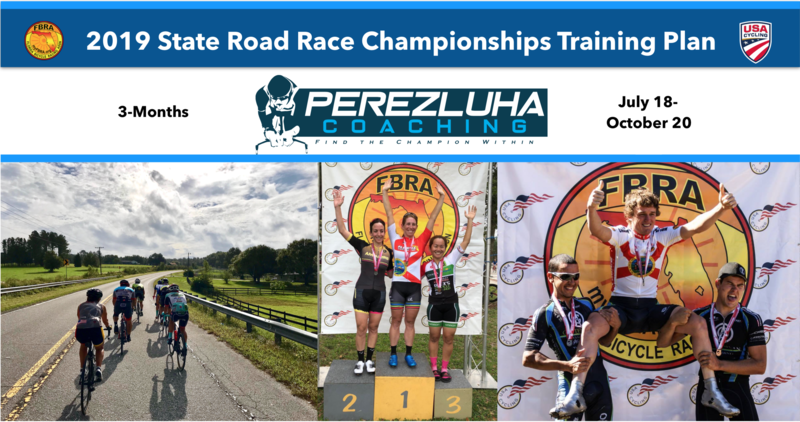 Training plan features key state road race workouts with course and hill simulations to prepare for the Florida State Road Race. Coaching Recon Ride – We will complete this ride within one month before the State Road Race itself. This will preview the road race course and lay out execution plan for race day. Each athlete’s State RR plan can be customized based on allowable hours to train and their current fitness level. Duration will be adjusted to meet schedule demands. Even if you only have 6-8 hours a week to train, we can fully customize your plan based on your schedule to maximize its benefit and get you prepared! The best feeling is going into a race trained and ready. Put the work in before and race more relaxed and confidently. 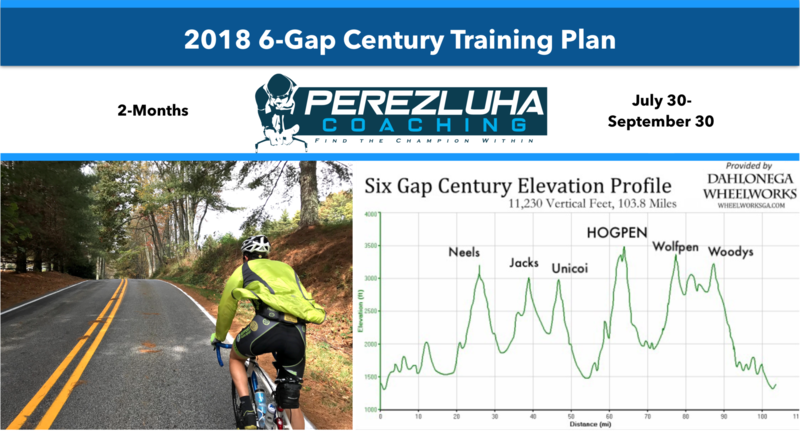 Get into the best mountain-climbing shape possible and ride at your very best in the 2018 3 or 6-Gap Century Ride on September 29, 2019. Improve your FTP, all-around power, climbing efficiency and ability, and pacing. Conquer the toughest climbs in Georgia for first time or improve upon previous efforts. Ride or compete in the 3 or 6-Gap Century ride with confidence and go into this event with the best possible preparation. Training Plan – You will receive a customized 2 months training plan starting July 28, 2019. This training plan is designed to improve hill climbing power, endurance, threshold power, mental toughness, recovery, climbing efficiency, and pacing up hills and climbs. Data Analysis – We will analyze together during our phone calls your power, heart rate, speed, and training data. Advice for Day of Event – You will receive specific advice on what equipment, nutrition, gearing and clothing to use specifically for this event. Ready to start your Training Program? Click the BUY NOW tab under each training plan and check out secure with PayPal. After purchasing your training plan, you will get an email and phone call from Coach Perezluha with client form and your training plan will begin.